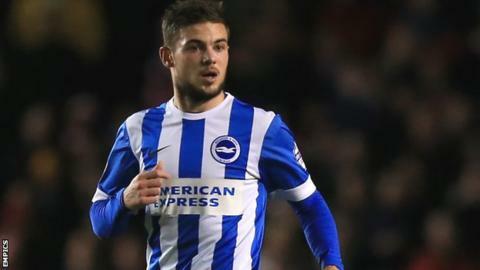 Brighton's Jake Forster-Caskey hopes playing for England's Under-21 side this summer will help him move on from a disappointing campaign personally. The 21-year-old midfielder, who helped England qualify for the European Championship in June, has only played eight games for the Seagulls in 2015. "It's been a bit of an up-and-down season," he told BBC Sussex. "The squad hasn't gone out but if I am in it then I've got something unbelievable to focus my mind on." Forster-Caskey has won a total of 13 caps for the Under-21s and has started five of their last six games. Three Lions head coach Gareth Southgate is yet to name his squad for the tournament in the Czech Republic, where England will face Italy, Portugal and Sweden in the group stage. "It's another summer where I won't really get a break but playing for your country is the biggest honour you can have," Forster-Caskey added. "Going into a tournament like that and coming up against the best players around the world in that age group will be a real test for me. "Hopefully it can improve me as a player for next year." Forster-Caskey was a regular earlier this season when Sami Hyypia was Brighton manager, but he has been used sparingly since Chris Hughton took charge of the Seagulls at the turn of the year. Having been part of the England side which qualified for the Euros with a play-off win over Croatia, Forster-Caskey has described his campaign as "a real rollercoaster". "One minute I'm on a bit of a low and the next I'm on a high," he said. "It is frustrating when I don't play and the season has been a bit of a disappointment. It's been difficult for me. "Maybe early on in the season I played a lot of games, I was going away [with England] and when people were resting I was playing. "I have no excuses. I have standards and I want to keep those standards and perform every single week. "I know what I can do and I just need to show it."